Most mums are worried enough about taking their baby into a coffee shop but when you're a queen in waiting with the second and third in line to your country's throne in the car seats in the back, you do things in style. 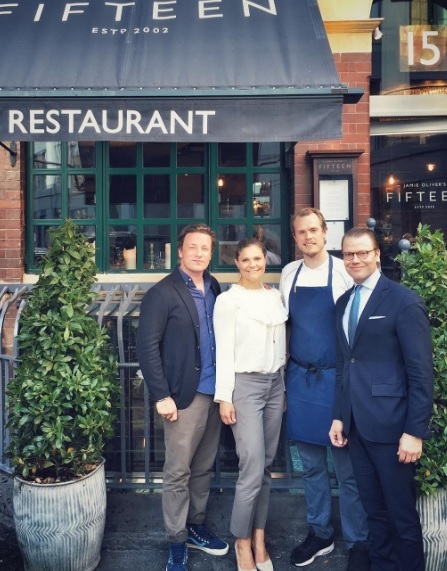 Which would explain how Crown Princess Victoria of Sweden ended up in the restaurant of celebrity chef, Jamie Oliver, ordering for Prince Oscar this week. Summer holidays means two things when it comes to the Royal Wardrobe. One, not as many appearances and two, a lot of casual clothes. But putting that aside, August 2016 still produced some standout summer looks so as the month comes to an end here are seven times we all went wow for outfits from the Royal Wardrobe. After welcoming home Team NL and celebrating their medal success at Rio 2016, it was back to business for Queen Maxima before August was even over. She has headed to Indonesia in her role as the United Nations Secretary General's Special Advocate for Inclusive Finance - it's government talks and a big conference for Maxima as the summer holidays come to an end. A picture tells a thousands words so what the Royal Houses of Europe share on their Instagram accounts is a pretty quick way of getting a message across. August has seen plenty of snaps shared to the social media platform and some of them have had huge hit rates. 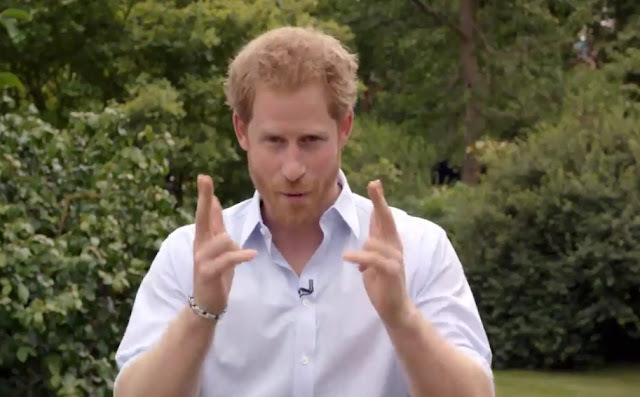 Here are the biggest Instagram hits on the royal accounts of Europe. 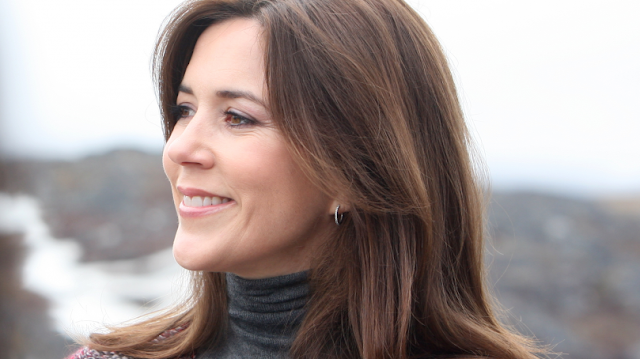 Crown Princess Mary of Denmark has headed to Greenland for a three day visit. She's there with the Mary Foundation and part of the reason for her visit is to take part in a conference on domestic violence. And as we've come to expect from Mary in recent times, she's not been afraid to tackle a tricky subject head on. She walked into a church a commoner and stepped out as the first lady of Norway. Sonja Haraldsen was a ground breaking new bride. She had waited nine years to wed her handsome prince and her marriage caused debate and controversy. 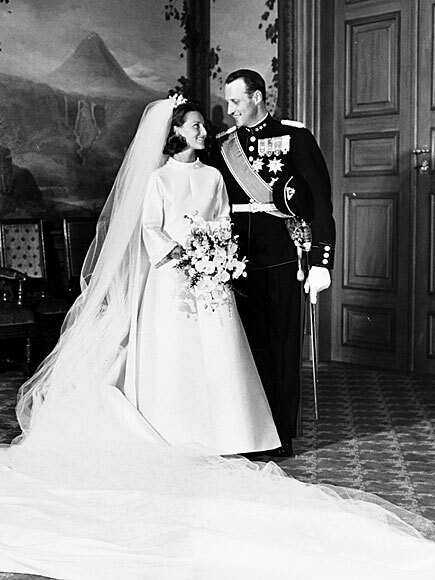 But it put her on a path that would make her Queen of Norway and today she celebrates 48 years of marriage. 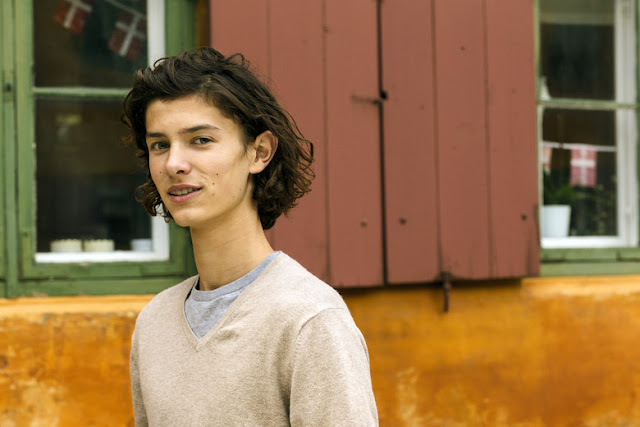 When I was 17, it was a very good year...the seventeenth birthday of Prince Nikolai of Denmark is something of a milestone and not just for him. 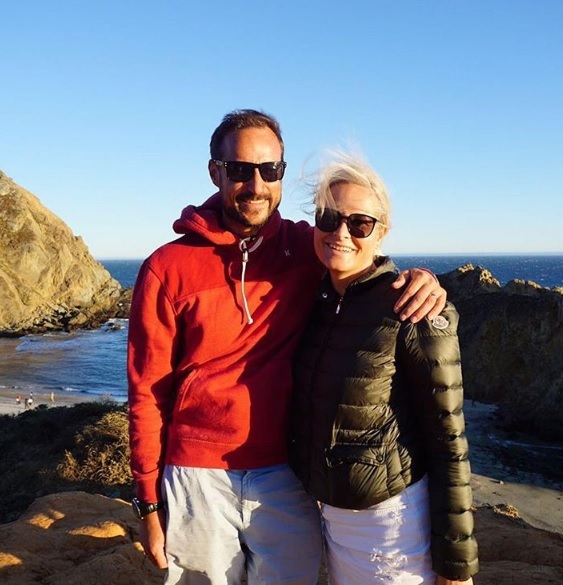 Because as is clear in new photos taken by Steen Brogaard, the eldest grandchild of Queen Margrethe II of Denmark is suddenly very grown up indeed. 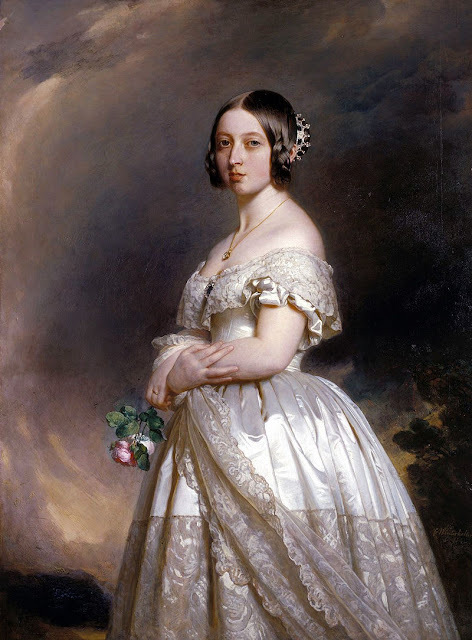 One of Queen Victoria's most famous coronets has been placed under an export ban after a buyer asked to remove it from the UK. ThIt's hoped that the ban, in place until December 27th, will allow enough time for a new purchaser inside the UK to be found - but they will need around £6 million pounds to secure this part of royal history. This time last week, they were cheering them to the podium in Rio. Now, King Willem-Alexander and Queen Maxima have welcomed the medal winners of TeamNL to one of their royal homes to celebrate their success at the Olympics. 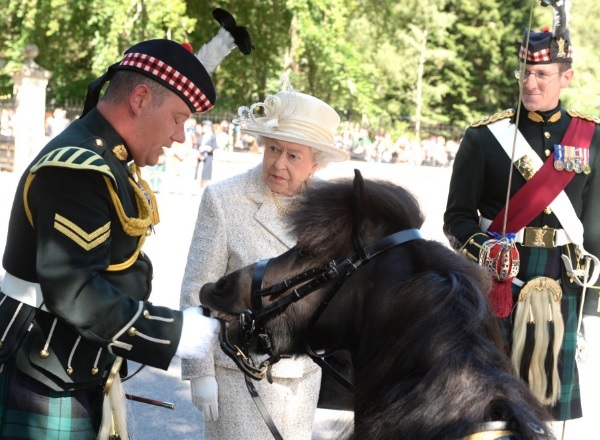 Royals are used to having their photos taken, it's an occupational hazard. 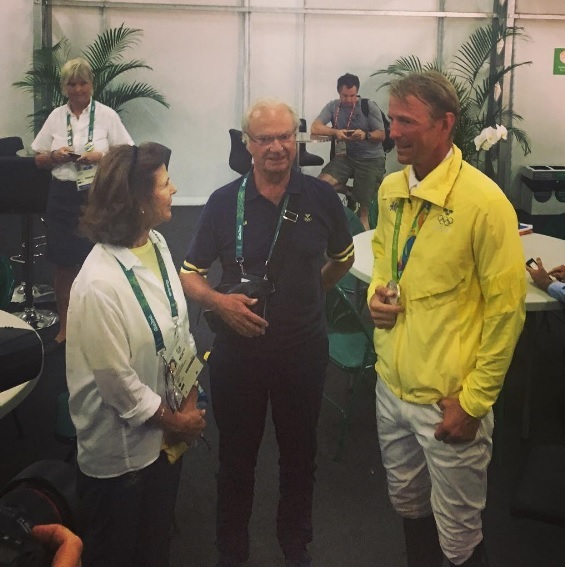 But in Rio, King Carl XVI Gustaf made sure he enjoyed life on both sides of the lens. For wherever Sweden's monarch went, so did his camera. Let's hope he's got a great eye for detail because this is one seriously chunky photo album that the family is going to have to sit through on the lengthening evenings. It might well help get the grandkids to sleep but judging from these images of the king of photographs, his queen has already had enough. 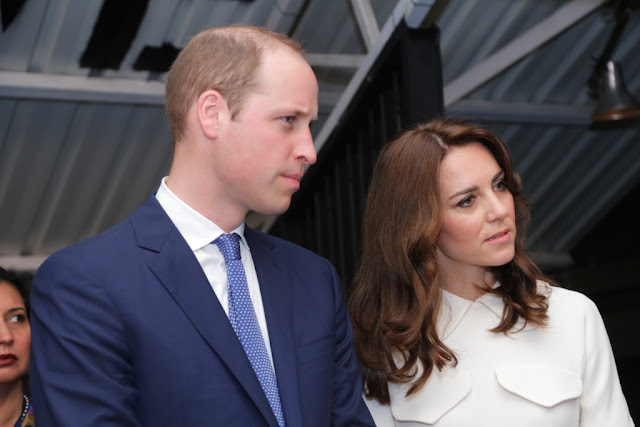 You can tell just how seriously William and Kate are taking their Heads Together campaign as they have spoken publicly about the importance of parents getting the support they need and not trying to be superheroes. As they visited YoungMinds to find out about their work, they both talked openly about the stresses of being parents and how much it means to know that help is available. Did a queen ever look more majestic on her son's wedding day? 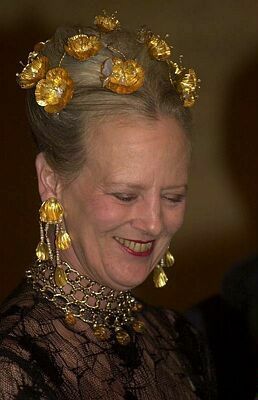 Sonja of Norway pulled out all the steps for the marriage of her son, and the heir to the country's throne, on August 25th 2001. She appeared in an unforgettable green gala gown but then when you've got perhaps the best set of emeralds on the continent to wear, why would you go for any other colour? One of the most famous royal weddings of the 21st century took place exactly fifteen years ago today. 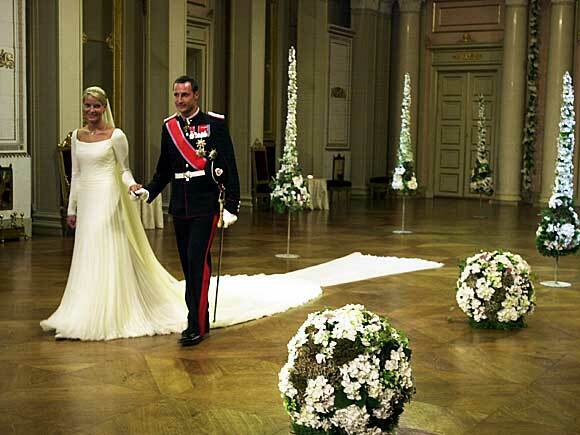 Mette-Marit Tjessem Hoiby stepped into Oslo Cathedral as a controversial royal fiancee and walked out as the wife of Crown Prince Haakon Magnus and as the future queen of Norway. And she wore a dream of a dress that is still a template for royal wedding gowns today to make her transition to Crown Princess of Norway. The new school term is just days away and it was back to normal for the Duke and Duchess of Cambridge as they carried out their first set of engagements after several weeks of summer holidays. 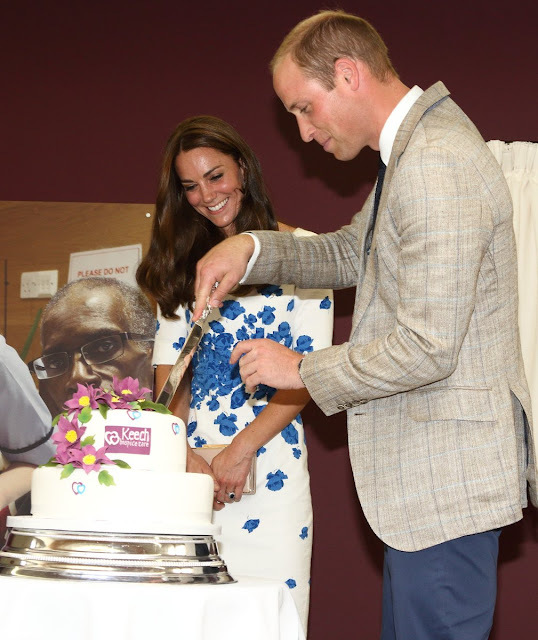 William and Kate were in Luton where they visited a youth project, an electric motors company and a hospice marking 25 years of caring for people with life limiting conditions. The couple focused on mental health, the economy and the hospice movement - all causes close to their hearts. 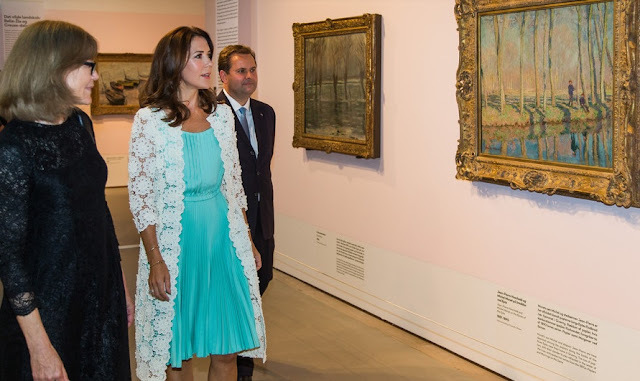 He's one of the best known Impressionist painters with works famous around the world and this week, the biggest ever exhibition of Monet's paintings to be held in Scandinavia was opened by Crown Princess Mary of Denmark. It's just your average summer day out. 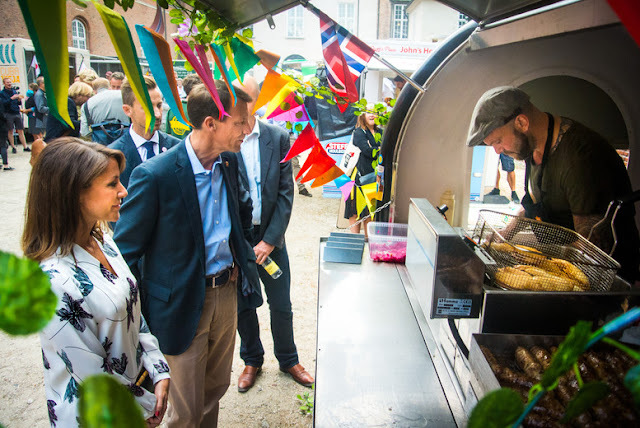 A stroll through Copenhagen, the smell of fast food cooking and a prince and princess hanging out at the hot dog van. Joachim and Marie of Denmark spent quite a lot of time propping up the bar of the takeout van this week but it was all in a good cause. Like eating hot dogs isn't a good enough cause already. 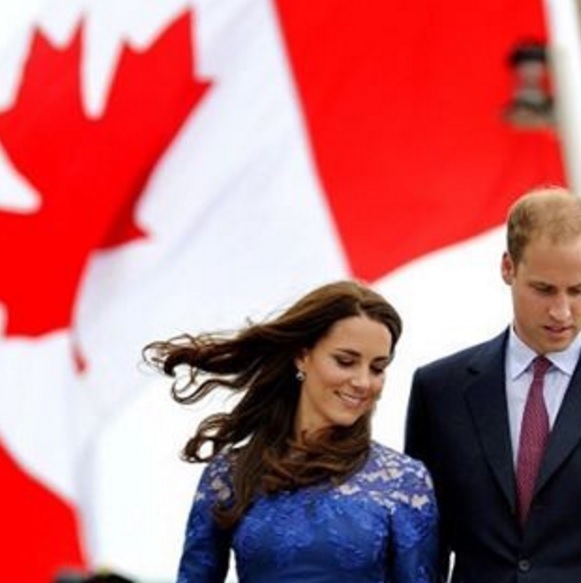 Get the diary ready, we now know when William and Kate are heading to Canada. The Duke and Duchess of Cambridge arrive on September 24th and head home again on October 1st. And there's no sitting around for this royal pairs - the week is jam packed already and they've not even got there yet. Prince Alexander of Sweden has starred in some new photos released ahead of his christening, set to take place on September 9th in the chapel of Drottninngholm Palace. And at four months old, he's looking quite the little man and very like his daddy. There's been a lot of royal support at Rio but even the members of Europe's ruling houses who are too young to make the long trip to Brazil have been showing their allegiance. Ahead of the women's gold medal match between Sweden and Germany, Prince Nicolas donned his team's home kit and showed them he was right behind them. Meet Sweden's youngest royal fan. The Rio Olympics are coming to an end in right royal style. As the final events of this year's Games are played out on a world stage, there is a collection of kings and queens watching on to give the last moments of this Olympiad a truly regal air. News that the Queen has been dishing up birthday cakes sent for her 90th to her dinner guests with their coffee should come as no surprise. As Lady Elizabeth Anson, the cousin who made the revelation said, the Queen does like to make good use of everything - no waste in the House of Windsor. 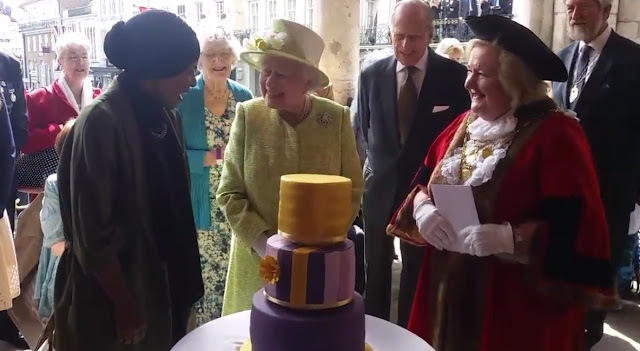 But given that some of the best royal photos around have involved Elizabeth II cutting a cake, why would anyone miss a chance to see the Queen slicing the sponge? To celebrate her birthday thriftiness, here are six special moments when the Queen cut cakes. Princess Anne has competition. The royal moment of the Rio Olympics, so far, has been her double act in the making with Andy Murray as they messed around at the official photocall for Team GB. But Queen Maxima of the Netherlands is in Brazil now and she's hitting her stride. And no one does royal celebrations quite like Maxima. 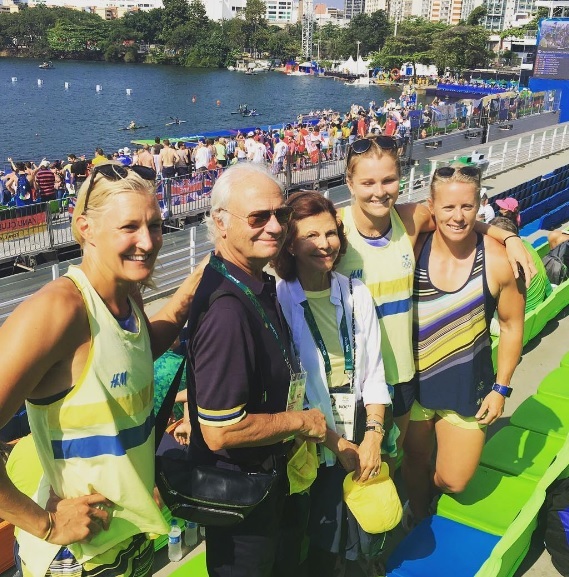 If ever the Rio Olympics were made for a royal, it was Queen Silvia. 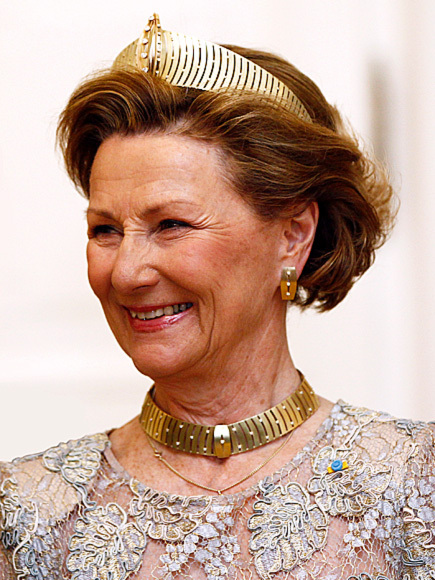 These games have plenty of reasons to be special for Sweden's longest reigning consort and the performance of her country's team is just one of them. 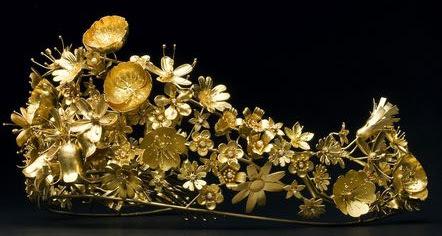 Silvia's royal romance began at the Olympics while the host nation of Brazil was also her home for part of her childhood and the country where her mother was born. 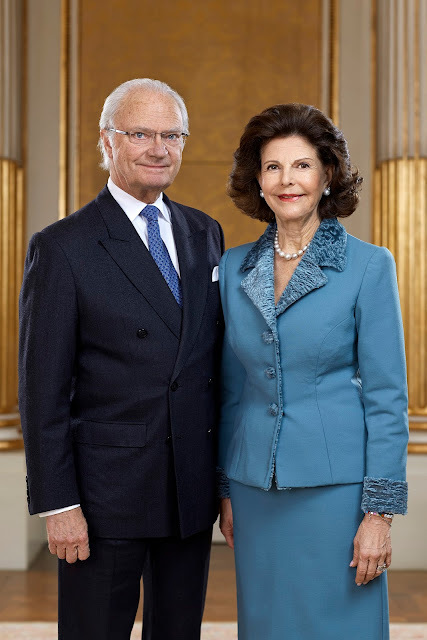 These games have plenty of meaning for Queen Silvia. Dad had already had a chance to take in the atmosphere of the Olympics and mum had had a pretty good time on her arrival in Rio too. 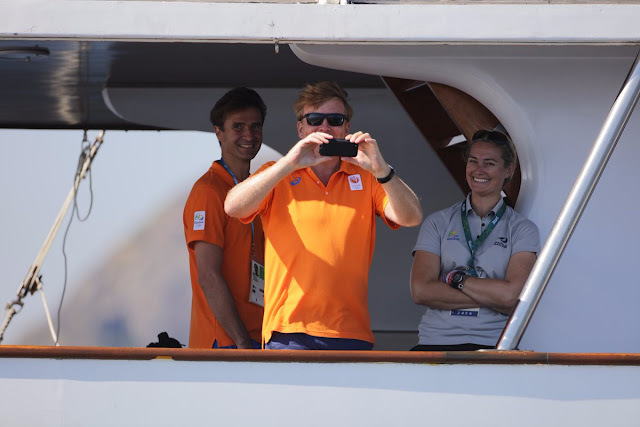 So it was only fair that Willem-Alexander and Maxima's three princesses got a chance for some summer Games fun too. Catharina-Amalia, Alexia and Ariana have arrived in Rio and they're thoroughly enjoying it. 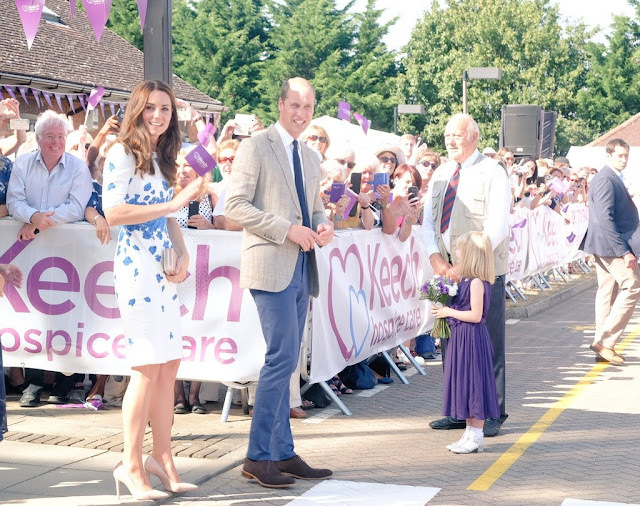 The Duchess of Cambridge has taken her campaign on mental health to mums and dads. 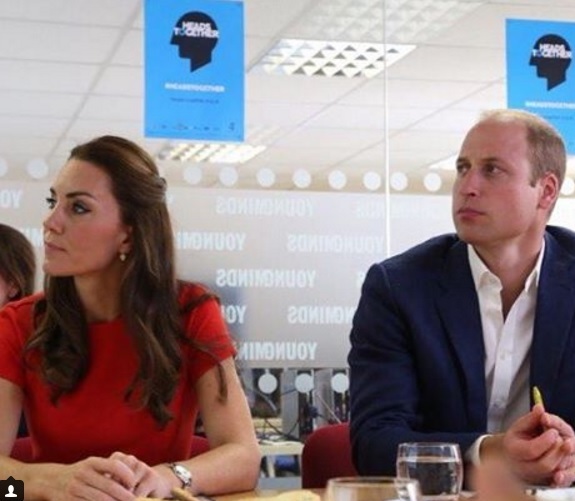 Kate has publicly given her support to a series of podcasts by the Anna Freud Centre which are focused on helping parents understand mental health problems in children. And she's drawn on her own experience of motherhood to help underline her message. One week filled with royal stories. It might be summer but there's still plenty of regal news to keep everyone interested and so to sum it all up, here's a look back at some of the highlights. It's time for the Royal Week, in Numbers. He became a byword for fashion, excess and glamour and despite ruling for a decade he is probably best known as the Prince Regent whose marriage set new lows when it came to royal unhappiness. 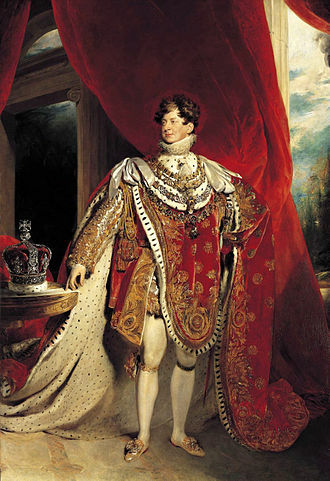 King George IV was born on this day in 1762. Princess Eugenie has added her name to two big lists in the last twenty four hours. First she's joined the princesses in magazines run down as she poses for Harper's Bazaar. And she's also joined the select list of regal ladies who have given us fairytale gowns fit for a princess in 2016. Here are five of the best. 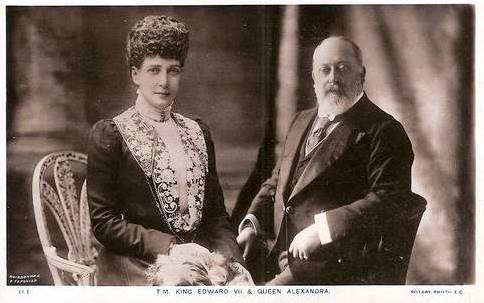 He waited decades to become king but on this day, in 1902, Albert Edward, eldest son of Queen Victoria, was crowned alongside his wife, Alexandra of Denmark. Two queens, one princess - three daughters. Eight decades ago Frederik and Ingrid of Denmark introduced the tradition of summer holidays at Grasten Castle. All these years on their three girls are enjoying some sun filled days there and smelling the roses. They might be royal but there's still nothing like a family holiday. That's it, everyone. Summer is actually and most definitely here. The Queen has arrived at Balmoral with enough clothes to see her through for two months. It's holiday time. 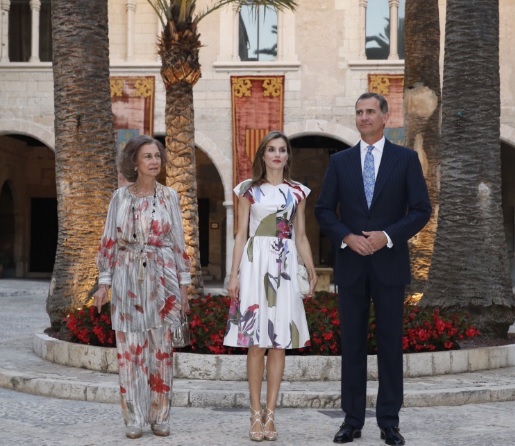 It's a tradition that usually marks the end of the public part of Spain's royal summer holidays and this year it took place on a perfect sunlit evening. King Felipe was joined by his wife and mother, Spain's two queens. for a reception at the Almudaina Palace on Mallorca before they walked into the sunset of this summer break to get ready for private holidays. There is something rather lovely about the Queen's decision to share the many birthday cakes she's been sent to mark her 90th with her house guests. As her cousin revealed that the sweet treats sent to Elizabeth II as she marked her big day are being dished up as dessert at private parties and receptions, the Queen has scored another hit. The Rio Olympics are under way and as they started with a flourish, there were plenty of royals in the stands of the Maracana stadium to watch the spectacle unfold. The opening ceremony of the 2016 Games was all about carnival - here's a rundown of the royals who went to Rio to celebrate the start of the 31st Olympiad. 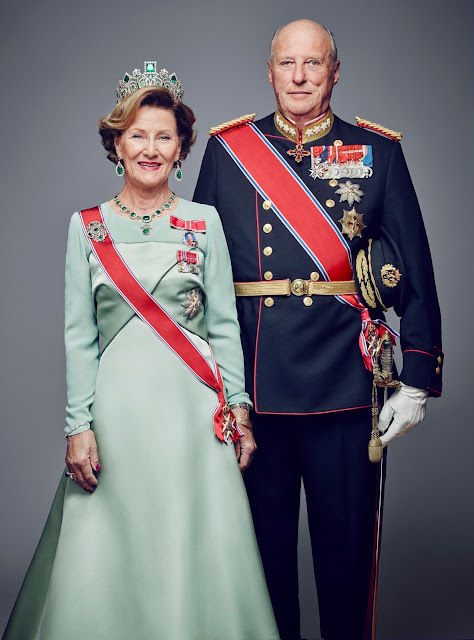 Princess Martha Louise of Norway and her husband. Ari Behn, have separated. 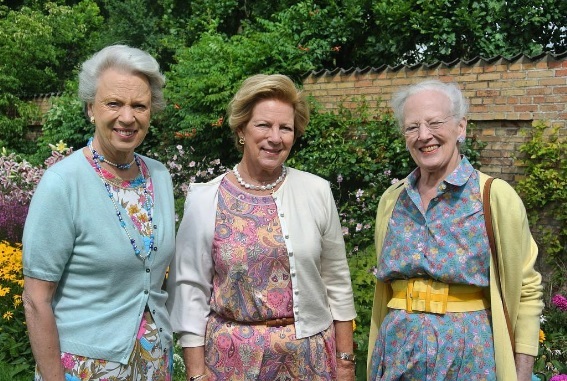 The Royal Court of Norway announced that the couple, who have three daughters, had parted with statements from the princess and her parents. It was low key, understated and touched by politics - pretty much like their whole year so far. 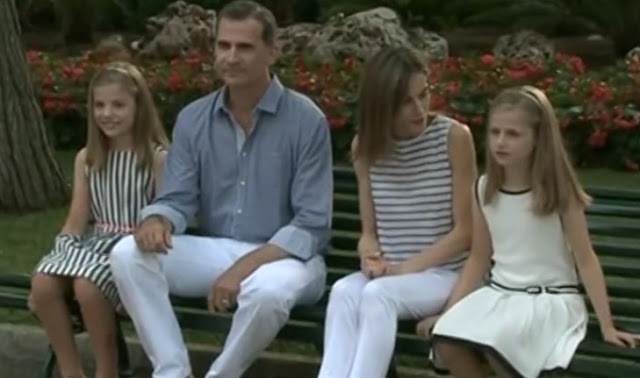 Spain's Royal Family have taken part in their traditional summer pose in but while other August evenings have been filled with chatter, this was all about a quiet sit down in the park. As a former Olympian, she's got bragging rights when it comes to getting things at the Games just right. And the Princess Royal wasn't going to let Team GB's flag bearer get away with his rather awkward attempts to get the Union Jack and the whole squad into a photo with just hours to go before the Olympics started. 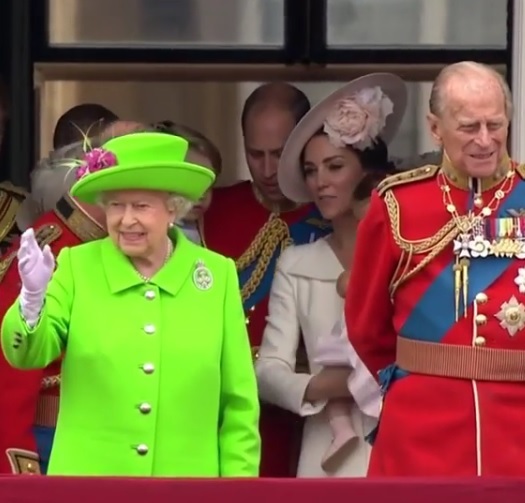 As Andy Murray juggled the flag, the Princess Royal joined in with the giggles and produced a double act in the making. 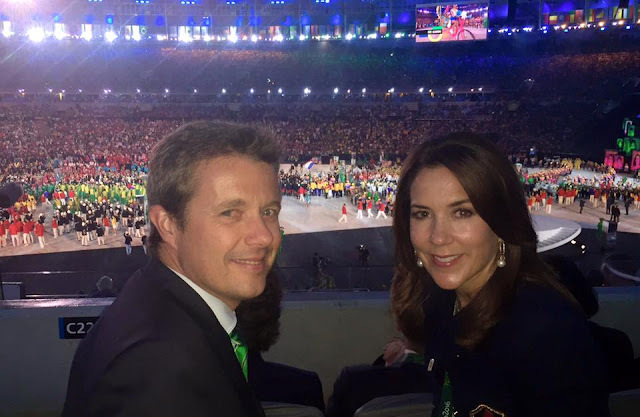 The Games are almost on us but while Crown Princess Mary of Denmark is owning Rio right now, other royals are starting to embrace the Olympic spirit. And straight out of the blocks with a gold medal winning performance are the Kensington Palace relay team of William, Kate and Harry. Her birthday was a summer tradition for years, ending the news with happy photos of a family celebrating alongside its matriarch. When she turned 100, millions marked the moment with her. 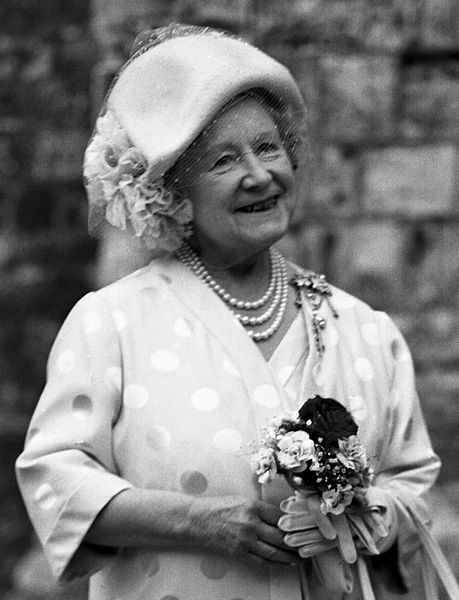 Queen Elizabeth, the Queen Mother was born on this day in 1900. 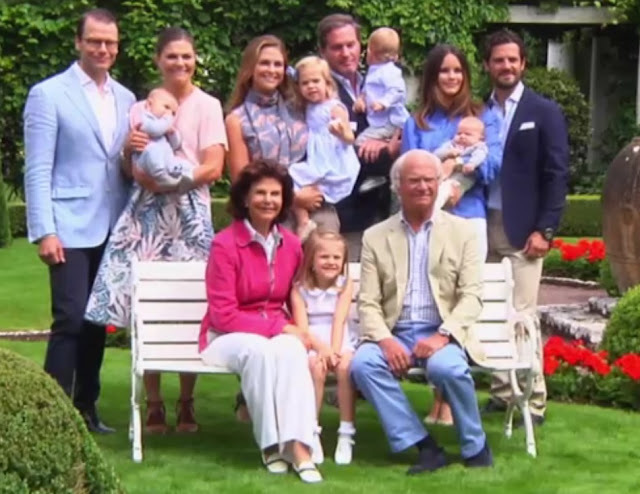 It's been a busy year for Sweden's royals so as they settle down to a relaxing summer holiday, here's a look at how the changes in their family have affected the line of succession. With two new princes in the palace, the path to the throne looks very different from the start of the year. So here's how the Sweden's succession looks now. This was an evening out all about family. King Felipe had barely arrived in Mallorca before he headed out for a spot of supper with many of his relations. 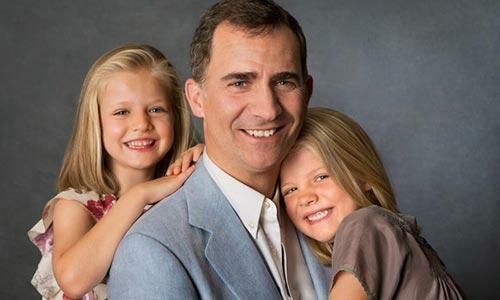 Accompanied by his wife, children, parents and older sister as well as her children, this meal gave the King of Spain a chance to show the world that the royal house he now moves as one. 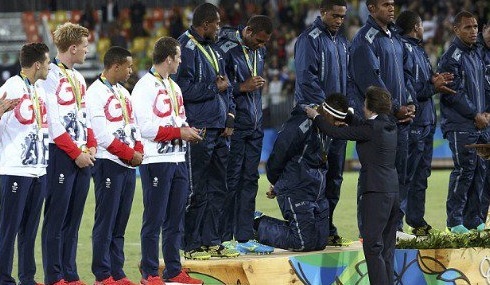 It was a powerful show of togetherness.